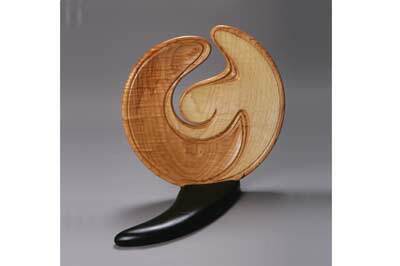 Betty Scarpino is internationally recognized as one of the masters of the genre, and she is widely referred to as one of the best woodturners in the world, providing inspiration for many within the craft. As a result, her work is held in private, public and museum collections throughout the world. As well as turning, Betty works full time teaching, writing, sculpting and printmaking from her home in Indianapolis, Indiana. Her wonderful work is available for purchase at some of the finest galleries in America and she exhibits widely in juried shows. She was awarded her second Creative Renewal Fellowship by the Arts Council of Indianapolis in 2007. It takes something significant to get Betty Scarpino out of her wood studio for any length of time, for she truly loves making art from wood. In fact, Betty is very philosophical in her outlook on life, and as such, tries to bring words of wisdom and inspiration into her working environment. For example, as you will see in the image of Betty on the opposite page, she has two separate writings on her wall, which say: "I love my creative life more than I love cooperating with my own oppression, and "The present is much more interesting than the past." "Both are quotes from books I've read, but I do not remember the book titles or the authors - I guess they say it all and I try to live by their messages." That said, the demands of her current position, editor of the AAW journal, have taken her away from her beloved studio, but editing is perhaps the one job she enjoys with an equal passion. To her new position she brings her love for wood and a pleasure in the written word. Betty is a woman whose creative energies are not confined to a single medium, and as a wood artist she is among the elite. Betty was born in 1949 in Wenatchee, Washington, USA where she grew up in the Pacific Northwest. Although she liked making things as a child, nothing in particular prepared her to become an artist. Her artistic development started after she entered the University of Missouri in 1975. Her desire to make things led her to industrial arts, where she learned how to design and make furniture and discovered a love of working with wood. Little emphasis was put on the creative and artistic aspects of woodworking, however, Don Bartlett, a professor in the art department, helped nurture Betty's creativity. She fondly remembers him as someone who recognised her creative talents and actively helped her develop her artistic nature. When Betty graduated, she became the woodshop supervisor at the University's Craft Studio. "As supervisor, my duties included overseeing the wood studio and teaching shop safety, a job that helped me make a transition from student to professional," says Betty. She also started selling her turned wooden objects at an artist cooperative. Her journey as a professional wood artist was well underway. A workshop taught by Michael Hosaluk at Arrowmont School of Arts and Crafts proved to be a turning point in Betty's artistic development. There, she cut apart her first turned object and began to explore the possibilities of combining woodturning and carving. Betty took another large step forward when she became a presenter at the AAW Symposium in 1996. Her presentations continue to be well received by audiences with a range of skill levels, beginners to advanced. She is a recognised wood artist, a teacher, and an editor. In 1996 she was chosen to be part of the AAW's 10th anniversary celebration exhibit, "Growth Through Sharing," and her piece 'Stepping Out of Line' was featured on the cover of the exhibition catalogue, a milestone in any artist's career. Betty continued to gain national recognition. 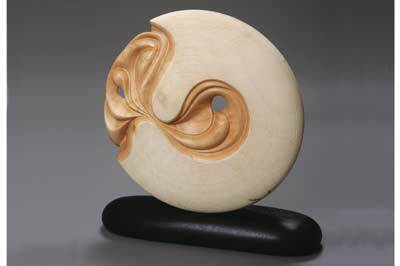 As a result of her achievements, Betty's artwork can now be seen in the permanent collections of museums such as the Renwick Gallery of American Art, Smithsonian Institution, The Mint Museum of Craft and Design, the Museum of Arts and Design, the Wood Turning Center, and the Yale University Art Museum. Betty's art represents a visual journal of her life. 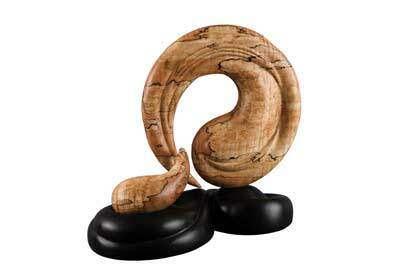 Her sculpture is abstract, yet personal, and contains tactile, sensuous, human, and often very female qualities. 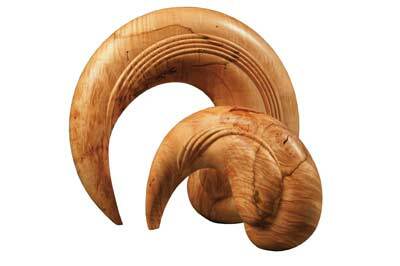 As such it is difficult to classify her as either a woodturner or a wood artist. 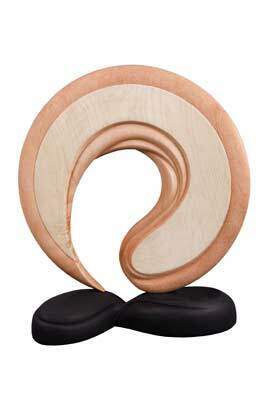 She is a sculptor who chooses to use wood as her primary medium. She represents a bridge to the larger world of contemporary art. "Artists create glorious objects when they incorporate their life experiences into a personal vocabulary, expressive of their own particular, splendid being. What I make is a mirror of who I am, so when I speak for myself, the message rings true and sincere," says Betty of the beautiful work she creates. In her 'Altered Plates' series, Betty explores the relationships between concave and convex surfaces, textured and smooth qualities, and parts that are folded together in sensuous curves so that the whole feels organic and even sometimes organ-like. 'Parting for Circumstances' has a sensual, feminine quality. 'Intimate Anniversary' expresses masculine and feminine coming together in a celebratory embrace. There is little to guess in the meaning of 'In Lieu of Housework.' In all of these pieces Betty demonstrates her masterful use of wood grain, texture, and colour. In the 'Egg' series, Betty ranges from creating simple egg shapes which are painted and carved to assembling eggs contained in bowl or nest-shaped forms. All clearly reference the concept of a woman as being an egg bearer and nest maker, as seen in 'Egg Vessel.' 'First Journey,' however, portrays a different feeling. Instead of being contained in a protective circular nest, three small white eggs seem fragile and vulnerable as they sit perched on their linear base. In her 'Disc' Series, the pieces have more volume and are more three-dimensional. Several contain multiple forms, and the relationship between the elements is as significant as the forms themselves. The viewer is left trying to figure out exactly how they relate - ambiguity is part of the message. In 'Whistling Women,' the pieces appear to be made from one disc, cut into two parts, a bit like puzzle pieces seeking to be reunited. In 'Familiar Strangers,' however, it is unclear whether one form is coming out of or going into the other. They appear to fit together, yet just how they became familiar is unclear. In 'Bridges Together,' the larger arching form ends in a sharp point, like a talon. Is it protecting, like a mother bird, the smaller, rounder form? Are these two bridges coming together? Are the two bridges even related? Or is one bridge protecting the other? More ambiguity. Several of the solitary pieces in the 'Disc' series are expressions of voluptuous curves, contoured forms, and textures in wood. The interplay between the interior and exterior folds in 'Undercurrent,' joined through a narrow opening, expresses the tension between what is presumably visible on the outside and the undercurrent inside. 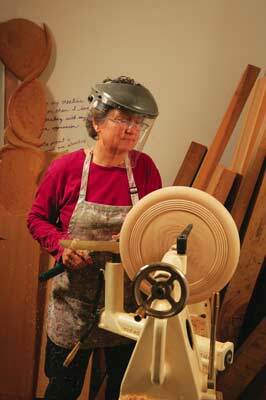 In 2008, Betty again became editor of American Woodturner, the same position she held 17 years ago. As editor she utilises all of the skills she has developed over the years. The hope is that she will somehow find the time to slip into her studio, find a beautiful piece of wood, and create another sculpture that continues the journal of her life. Recently, Betty received a major commission that she will work on this autumn and winter. "The couple who commissioned the piece understand that creating a major sculpture will take months because of my full-time job as editor. Even so, part of their incentive is to provide me with an opportunity to spend more time in my studio." Betty is excited about the prospect of working with two people who understand the delightful process of a collaborative commission. Working in this manner can lead an artist to renewed creativity and productivity. "When the time comes to give up my job as editor, I look forward to seamlessly moving back into the creative world of turned-wood sculpture,"she finishes. Due to space restrictions, many of the pieces discussed within this article are not pictured here. However, you can see these pieces as well as others by visiting Betty's website.